On the River was written and illustrated by Roland Harvey, published by Allen and Unwin, 2016. It joins many other books by Harvey - like In the Bush, In the City, All the Way to W.A - in depicting aspects of Australian life. 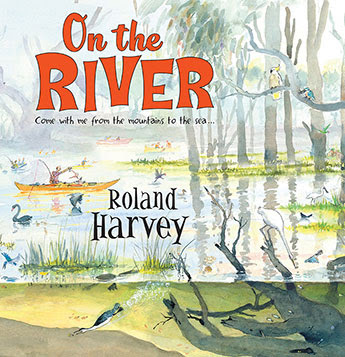 Follow the mighty Murray River from the mountains to the sea on an epic journey with Roland Harvey and his pelican friend, in this glorious picture book full of humorous, intricate illustrations and fascinating information. Roland Harvey and his new pelican friend are off on an adventure to walk, fish, canoe, raft, windsurf, sail, paddle-steam, houseboat and even fly their way along the Murray River, from its smallest beginnings in the high country to where it meets the sea. Together they discover the story of the river: its secrets, history, ecology, people and animals. And you're invited, too! A delight for all ages from the creator of the bestselling At the Beach series. I enjoyed the variety of perspectives and subjects in this charming children’s picture book. It really is a book kids will pore over because of all the delightful and often humorous detail. Harvey’s illustrations are quirky, evocative and kids will find them lots of fun. I love the way the book also serves as a game, with children invited by the Pelican to find Harvey on each page. As the river finds its way from its headwaters to the sea, we learn about many riparian environments. Along the way we pick up tips on descending a cataract in a boat (Book of Prayers might help), ski etiquette, things to catch (from a cod to a cold), paddle steamers and bum boats, megafauna, and we’re invited to spot one small (glaring!) inaccuracy. Because the Murray River is such an important feature of Australia, and because the book also provides an insight into so much of our way of life, I believe On the River is a must for all library collections. Schools in particular will love this important children’s picture book that will enhance their Geography and Science resources. There are also Teacher Notes available for download from the A and U website.